1. The Standard, a 228-unit apartment complex near Hardy and University drives in Tempe, sold for $31.3M. Neil Sherman and Shane Benjamin of Sperry Commercial represented both the buyer, Tides Equities, and seller, 29th Street Capital. 2. Cushman & Wakefield announced that Pacifica Real Estate Group purchased Pecos Gateway Business Park, a 126KSF three-building industrial property at 8743 E. Pecos Rd in Mesa, for $14.6M. Bob Buckley, Tracy Cartledge, and Steve Lindley of Cushman & Wakefield’s Phoenix office negotiated the transaction on behalf of the seller, Boomerang Capital Partners. 3. Phoenix Commercial Advisors closed on the Shoppes at Parkwood Ranch, a 93KSF shopping center at the NWC of Signal Butte Rd and Sothern Ave, Phoenix, for $13M. Steven Underwood and Chad Tiedeman at Phoenix Commercial Advisors represented the seller, Weingarten Investments, Inc.
4. Boyd Watterson Asset Management affiliate, Boyd State Tucson, LLC bought the building at 2255 West Ina Road in Tucson for $10M in an all-cash transaction from WRM Loans and PVP Investments. The 3-story, 46.1KSF, high profile building was fully leased to The Department of Economic Security and the Bureau of Alcohol, Tobacco and Firearms. 5. Reliance Commercial Real Estate announced the sale of Union Crossing, a two-building, 79KSF shopping center at 4330 W. Union Hills Rd, Phoenix, for $9.13M. Jake Danovic of Reliance represented the seller, Eleven Investments, and sourced the out of state buyer for their first acquisition in the Phoenix MSA. 6. CBRE has completed the $5.88M sale of a portfolio comprised of two single-tenant retail properties at the SWC of 24th St and E. Baseline Rd, Phoenix. The first is a Chick-Fil-A and the second is a Wendy’s. Joseph R. Compagno and R. Max Bippus with CBRE’s Phoenix office represented the buyer, Rossmore Enterprises, and seller, Next Gen Development, LLC, an entity controlled by Helix Properties, LLC. 7. Walter & Sons, LLC purchased a 44.7KSF industrial building at 4551-4571 S. Alvernon Way in Tucson, from HS-Tucson AZ, LLC for $3.865M. Russell W. Hall, SIOR, GSCS and Stephen D. Cohen, Industrial Specialists with Cushman & Wakefield | PICOR, represented the buyer. William Di Vito with CBRE, Inc., represented the seller. 8. VIAONE arranged the sale of a 10.2KSF, single-tenant NNN Child Care Learning Center occupied by Tutor Time at 1928 N Gilbert Rd, Mesa for $3.25M. VIAONE, Founder and Designated Broker, Marc Bonilla represented the seller, Arizona Parkside LLC, and Taylor Street Advisors, Vice President, Jake Baratz represented the buyer, Klaus Meister. 9. Corsair Management, LP sold the 28.1KSF building at 4670 S Palo Verde Road in Tucson for $3.2M. David Newton, SIOR of Lee & Associates in Orange, CA represented the buyer, a Family Trust from Long Beach, CA. The building was fully leased to Gerber Collision and Glass. 10. SVN | Desert Commercial Advisors announced the sale of a 21KSF parcel at 811-817 N. 3rd St, in the Roosevelt Row district of Downtown Phoenix, for $2.148M. SVN Senior Advisors Justin Horowitz and Paul Borgesen III procured the buyer, Jon Vento with True North, represented the seller, Paul and Janet Bonn. 11. CGI Federal, Inc. leased 50KSF at 7333 E. Rosewood St. in Tucson, from 1510na, LLC. Greg Furrier, Retail Specialist with Cushman & Wakefield | PICOR, represented the tenant. 12. Advanced Circuits signed a 10-year lease for 48KSF of manufacturing space at a new location near Chandler Blvd and 56th St. Sebastian Sica and Rich Sica of DAUM Commercial Real Estate Services represented Advanced Circuits in the deal. The lessor in the transaction was Ivanhoé Cambridge. 13. Harbor Freight Tools USA, Inc. leased 16.5KSF in Northview Plaza, located at 3739 N. Oracle Rd. in Tucson, from Shenitzer Development, LLC. Dave Hammack and Ron Zimmerman with Cushman & Wakefield | PICOR, represented the landlord; David Jarand with Strategic Retail Group, represented the tenant. 14. Lutheran Social Services of the Southwest has consolidated and relocated its headquarters to Airport Office Park at 2502 and 2516 E. University Dr. The nonprofit organization leased 16.3KSF of space comprised of five different suites at the property. The team of Kathy Foster, MCR, Phil Breidenbach, SIOR, Kyle York and Sarah Stecko, CPMC of Colliers International Arizona represented the charitable organization in its real estate search and negotiations. 15. SOLON Corporation leased 12.1KSF at 2155 N. Forbes Blvd., Suite 101 in Tucson, from Forbes Tucson, LLC. Rob Glaser, SIOR, CCIM, Industrial Specialist with Cushman & Wakefield | PICOR, handled this transaction. 16. 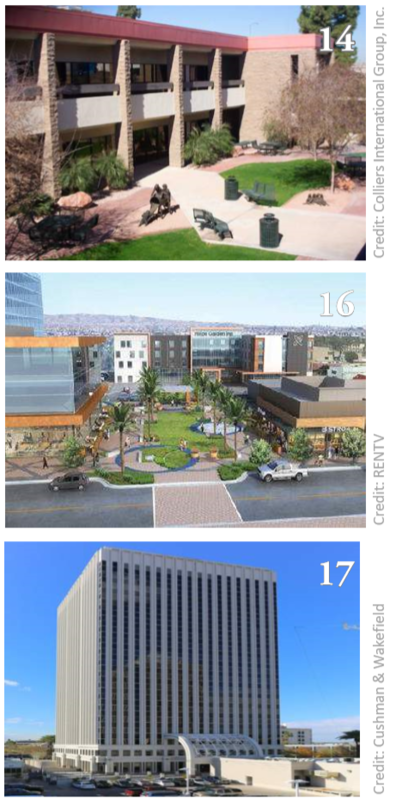 Great Western Bancorp Inc agreed to a 10-year lease for 10.9KSF of space in the new mixed-use development, New Square Chandler at 180 S Arizona Ave. Laurie Sandau with Avison Young represented the tenant. The landlord, Spike Lawrence Ventures I LLC, was represented by BD Baker Company. The lease value was not disclosed. 17. Cushman & Wakefield has announced that Randstad signed a 10.7KSF lease at 3838 N. Central Avenue in Phoenix. On behalf of Randstad, the transaction was completed by Curtis Chickerneo and Larry Downey of Cushman & Wakefield’s Phoenix office and Allison Bittel of Cushman & Wakefield’s Atlanta office. John Bonell, Brett Abramson and Chris Latvaaho of Jones Lang LaSalle represented the landlord, Parallel Capital Partners, Inc.